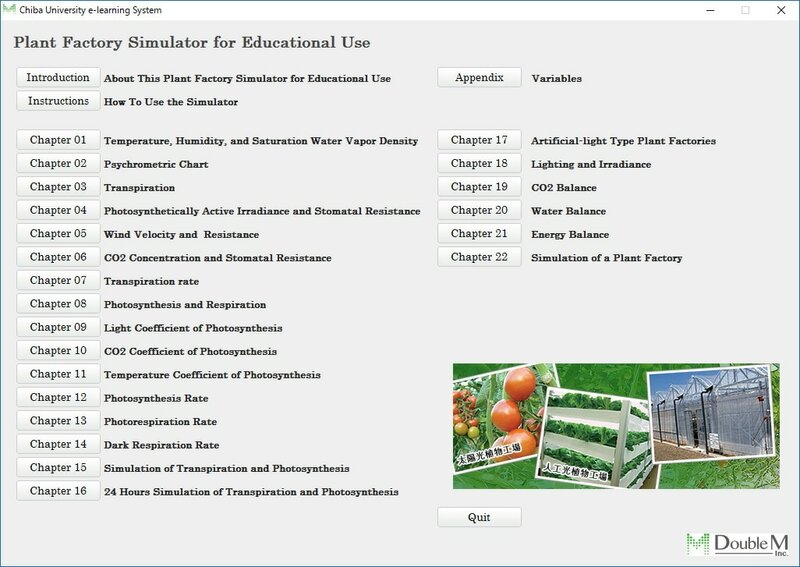 Plant Factory Simulator for understanding plant/environment fundamentals. To purchase the product key, click [Buy Now] button above. ​After we receive the payment, we will send you the key by email in a week. Click above to download the software. ​To execute the program you need a product key. This is an educational software for learning basics of plant functions in response to the environment, as well as energy and mass budget of indoor farming facilities or plant factories. In many chapters, you will obtain fundamental knowledge in areas related to plant cultivation. You will also learn about what is going on inside the cultivation room of plant factories. This software does not only intend to learn how to construct simulators, but also to use it in the actual area of plant production. For example, you can use it to decide what temperature should be set under certain environment conditions, or you can calculate how much Amps required to operate a plant factory. We hope you will find this e-learning software useful in your academic/business life. Please be aware that this is an educational software for basic knowledge and methods of calculating plant/environment parameters. Theories behind the simulation are not fully proven or tested for accurate results. The outcome of simulation is for rough estimate purpose only. We do not guarantee any accuracy in the results, although numbers does not seem too far off from the reality. You can find more accurate methods to calculate photosynthesis and transpiration rates than the ways introduced here. However, those are usually very difficult to understand for many non-major students and managers/workers at production facilities. We decided to choose simpler models for ease of understanding and not for scientific accuracy.